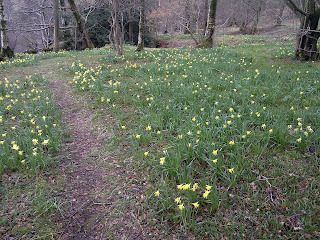 The beginning of the year always sees Wordsworth point being prepared for Daffodil season. After a summer of Bracken growth the area needs strimming and clearing to allow this year’s Daffodils a chance to grow through. This area is called Wordsworth point; because it is supposedly the spot that inspired William Wordsworth to write is famous poem ‘I wandered lonely as a cloud’. Dorothy Wordsworth, Williams sister said in her journal that she had never seen ‘daffodils so beautiful they grew among the mossy stones about and about them, some rested their heads upon these stones as on a pillow for weariness & the rest tossed and reeled and danced & seemed as if they verily laughed with the wind that blew upon them over the Lake, they looked so gay ever dancing ever changing’. Every January before the bulbs have a chance to send up a shoot, the area is strimmed. This picture was taken on January 17 and already a few where beginning to appear from the undergrowth. As well as clearing the bracken and brambles it was decided this year that a bit of the natural regeneration would be cleared from the road side, to allow motorist the chance to see the daffodils as they are passing by. This involved cutting back any small sycamore that had started growing and clearing any hazel stands that had started to get out of control. This work has much improved the area and will hopefully allow some more light in to help the daffodils to flourish. If you are around Ullswater in spring, please go down and have a look at the colorful showing. 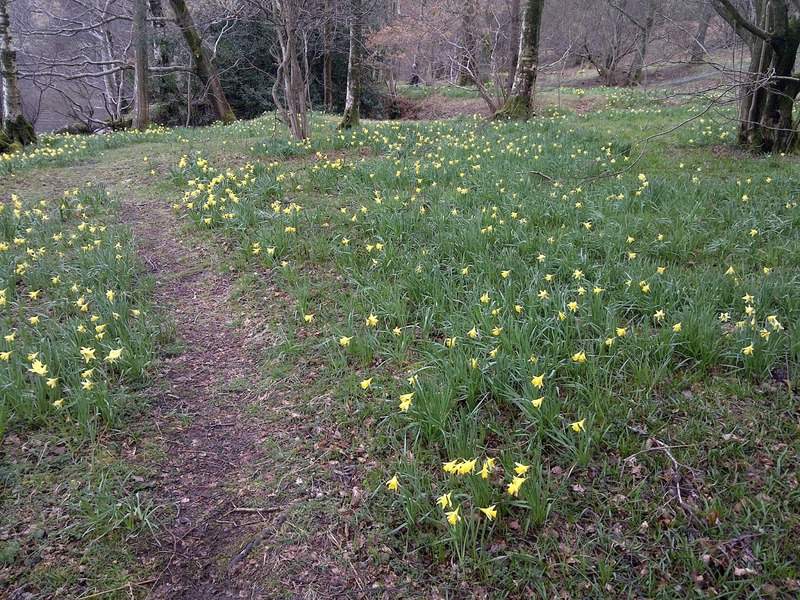 Or even better pop into the welcome building at Aira Force car park to pick up a Daffodil walk that takes you along the lake shore finishing at Wordsworth Daffodils.